Swimming in events can take on a whole number of guises. There are organised events or 'meets' across England and you can find out more about those competitions on the ASA's swimming calendar. If you want to find out more about swimming-related events and challenges across Derbyshire, then use our club and activity search. 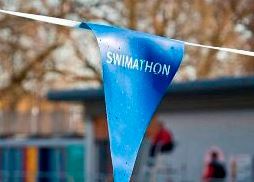 Swimathon is the UK's biggest fundraising swim encouraging swimmers up and down the UK to swim a variety of challenge distances at their local pool and raise money for charity. Over the past 27 years of Swimathon, more than half a million swimmers have taken part, raising over £40million for charitable causes. This year's event took place from Friday 17 to Sunday 19 April 2015, fundraising for Marie Curie, with swimmers taking on individual 1.5k, 2.5km or 5k challenges or the Team 1.5k and 5k. 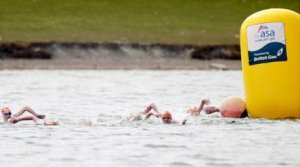 Open water swimming is a fun alternative to getting in the pool. Although most people think of swimming as an indoor pursuit, competitive swimming has its roots very much in taking to the water outside. 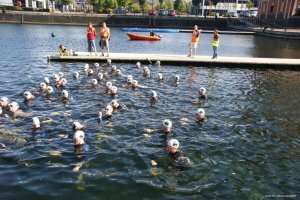 'Marathon' swimming races can take place in any large outdoor body of water: seas, lakes, rivers, canals, reservoirs, with the distance of each event varying between 1km and 80km. It was not until 1986 that FINA, swimming's world governing body, officially recognised open water swimming - click the link to find out more - as an event and added it to the international competition calendar. 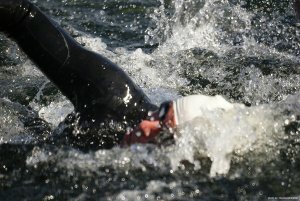 Swimming is a key part of triathlon. Swimming is the first discipline of the sport of triathlon that has become particularly popular in the last few years, with Alistair Brownlee winning the gold in the Olympic distance event at London 2012. Distances - and therefore swims - can vary greatly between 200m for a super-sprint event and 4kn during an ironman - and can be pool-based or open water. For comprehensive details on when and where you can take part, view the British Triathlon Federation website. If you want to measure your success as you begin to improve and get motivation from like-minded work colleagues, you can log your swimming as part of the Derbyshire Workplace Challenge. It's free to sign up, easy to use and will give added incentive to keep diving in.